Swinging a large-impact tool like a splitting maul, it is natural that sometimes you will miss. Each miss has takes a huge toll on the handle of the splitting maul, whether wooden or fiberglass. The result is that the handle will give way (or break) or the head of the maul will loose. Wooden handles are more predisposed to breaking while fiberglass handles can last indefinitely. However, broken maul handle does not the end your log splitting work or the usefulness of the tool. The vast majority of splitting maul owners will think of finding a professional repair person to do the job while others will think of buying a brand new ﻿splitting maul. What may not be apparent to you is that you can actually replace a splitting maul handle by yourself if you just knew how easy the process could be. The best thing about replacing splitting maul handle is that you can fix a new, stronger handle. So, how do you go about replacing a splitting maul handle? Rather than replacing your old or broken wooden handle with a new wooden handle, you can replace it with durable fiberglass handle. Fiberglass is costly but it will not require replacement as frequent as a wooden handle would (sometimes as frequent as once yearly). 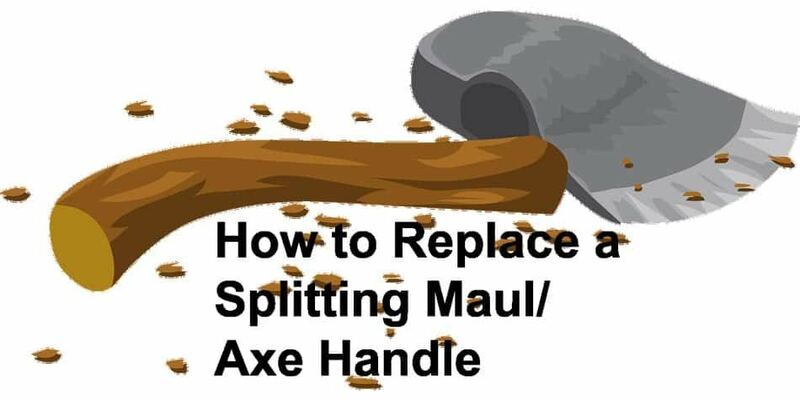 Here is how to replace a splitting maul handle. Step 1: Saw off the maul’s old handle close to the head leaving just about 1/4-inch of the wood projecting from the bottom of the head. A power saw or a simple handsaw will do the job. Step 2: Open the vise grips such that the opening is wider than the width of the handle but narrower than the head of the maul. Put the head of the over the vise grips with the remnant of the handle over the open space. The edges of the maul head should rest on the sides of the vise. This way, the top of the maul head will face upwards allowing you to drive the wood out in the same direction it was installed. Step 3: Drill a number of ¼-inch holes through the wood remain in the maul head. Be careful not to drill into the metal wedges in the wooden handle. The holes serve to relieve pressure on the wood from the wedges. This pushes the wood tightly against the inner side of the maul head. Step 4: Hold a large chisel, bolt or similar tool, in the central part of the wood and tap it gently with a hammer to push out the remnant wood from the maul head. Frequently repositioning the chisel or bolt in different places, remove the entire wood. Step 5: Remove the vise grips from the maul head and then clean the handle hole thoroughly to eliminate any grime or grease. In case there is a build-up of gunk and grease then you can spray with degreaser to eliminate them. You can then use sand paper/wire brush to remove all debris and prepare the inside surface of the maul head to receive the new handle. Step 6: Insert your new fiberglass handle in the hole from the bottom end of the splitting maul head. You can then flip the handle and head over. Holding the maul head in your hand, tap the handle from its bottom on a hard surface few repetitions until the top of the handle is level with the top of the maul. Step 7: Rub caulking cord sealer in both of your hands to warm it so it adheres well to the handle. Rub the sealant continually until you form a strand equal in length to the circumference of the handle. Encircle the caulking cord sealant around the handle at the point where the bottom of the maul meets it. Force the sealant down space where the two objects intersect to create a seal that stops epoxy from leaking. Step 8: Now you can slip splitting maul head over the handle so that the top side of the head faces up. Then mix two units of epoxy together in a container prior to opening (each new fiberglass handle comes with epoxy). The delivery comes with instructions to help with how to use the epoxy ingredients. Step 9: You can then pour the epoxy mixture into the hole that is between the fiberglass handle and the maul. Ensure you pour the epoxy slowly initially while checking if the caulking cord sealant really reaches the bottom of the handle and there is no leaking. Go on pouring the epoxy in the hole until the epoxy is flush with the upper part of the handle and top of the head of the maul. Step 10: Once you are sure that the epoxy is well poured and everything is done well, go ahead and set your repaired splitting maul in a cool, dry location with temperature ranging from 75 to 115 degrees Fahrenheit. It should stay free for up to one week to allow the epoxy to cure properly. Ensure you do not use the splitting maul before the epoxy fully cures. Note: The fiberglass handle might be too long for the splitting maul head. If that is the case then you can use a rasp to try to file it down until it rests flush with the top part of the splitting maul to look presentable.